SERVPRO of Danvers/Ipswich provides 24-hour emergency service and is dedicated to being faster to any-sized disaster in Haverhill. We can respond immediately to your emergency and have the expertise to handle your restoration or cleaning needs. Owner, Dave Hart, conducting a training session with our crew. The IICRC has been the driving force in establishing industry standards and reference guides for professional carpet cleaning, water damage restoration, and mold remediation. These standards take years to develop and require the coordination of experts in the field: manufacturers, industry organizations, insurance professionals, training schools, contractors, and public health professionals. Clogged gutters can cause flooding through your roof or foundation. Springtime has arrived and now is a great time to take care of some outdoor maintenance of your home. You can prevent water damage in your home before it happens with a couple of simple tips. When leaves and debris clog your gutters, the water can’t drain out the downspouts and away from your property. This lack of drainage can cause the water to come back through the roof or the foundation, resulting in a flooded basement or water coming through your roof. Keeping your gutters clean is a simple way to prevent unwanted water from entering your home. Sometimes outdoor faucet leaks are obvious- you will see the water dripping out. Other times, the leak isn’t visible from the outside. One way you can test for possible leaks is to turn the spigot on and press your fingers against it. The water should spray out through your fingers with good pressure. If the water pressure is low and doesn’t spray out, this maybe an indication of a leak and further investigation should be done to check for leaks. If you do find yourself with water damage, SERVPRO of Danvers/Ipswich is here to help. Call us at 978-777-3498 to schedule an estimate. Production Training Session before the day gets started. As part of their continued training, our Production staff recently completed a Mold, Asbestos, Lead and Biohazard PPE Safety Certification which taught proper handling techniques when encountering these potentially toxic materials on a job site. This training not only addressed their personal safety when exposed to one (or more) of these materials but how to contain and reduce the possibility of airborne spread. Biologist and Industrial Hygienist, Regan Yerhot Robins conducted the training and is one of the many industry experts SERVPRO of Danvers/Ipswich can call upon when necessary. This proactive approach to conduct on-site testing within the first couple of days of a claim can help to significantly reduce cross-contamination and ensure the entire claim is mitigated appropriately. The safety of our employees, as well as environmental concerns, are top priorities for SERVPRO of Danvers/Ipswich. We go above and beyond industry standard to handle all aspects of any damage, commercial or residential, with a level of excellence that is unsurpassed. You can feel confident that when we walk into your home or business, we bring the strength of advanced technology, equipment, and knowledge to every job. 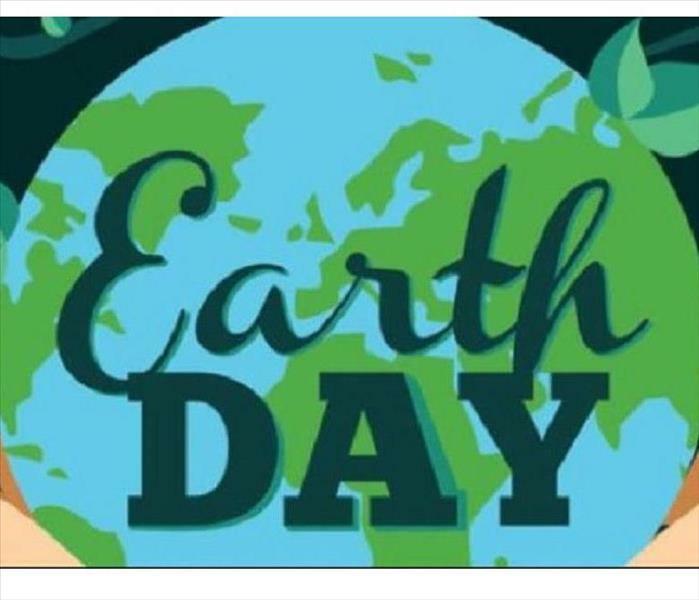 Earth Day is a big event at SERVPRO of Danvers/Ipswich. Last year, we canvased the local area helping out wherever we could – working with towns to clean parks, supplying water to thirsty volunteers cleaning Crane Beach and working with organizations like Rebuilding Together to help out specific individuals. On a larger scale, we wanted to make a positive impact on the wide-spread loss of trees after a very rough winter so we partnered with the Earth Day Network and committed to 300 Acts of Green. We handed out 300 evergreen saplings to our customers in Danvers, Ipswich, Boxford, Topsfield, Georgetown, Rowley, and Newbury. This year, to support the Earth Day Network 2019 campaign “Protect Our Species” which calls attention to endangered and threatened species, including the bumble bee, we’ve partnered with the Sustainable Horticulture department at Essex North Shore School in Danvers, MA to grow 300 flowering plants that we can deliver to our customers. These amazing students have selected 4 varieties of flowers that attract bees and promote pollination. In the long term, increasing our bee population affects us all so we hope you will join us in being a part of the solution. We will be posting progress reports on the plants, leading up to the delivery so check our Facebook page often to see the latest updates and to enter giveaways that we’ll be announcing throughout the month of April. Check in with your local town to find out how you can be a part of Earth Day in your community. Photocatalytic Oxidizers remove unwanted odors and clean the air. Springtime has finally arrived here in Ipswich, bringing longer days, rising temperatures, and yes, you guessed it...rain! April showers bring May flowers, but they also can bring flooding issues to your home or business. Spring storms can bring several inches of rain in only a matter of hours or there can be consistent rainfall for days. These heavy rains can lead to severe flooding by over-saturating the ground, overfilling storm drains, or rivers spilling over their banks. Untreated water damage from rain flooding can create a pungent, earthy, muddy smell. To prevent unwanted odors in your home or business, it’s best to be proactive and handle the water damage as soon as the flooding occurs. If the odor already exists, SERVPRO of Danvers/Ipswich has specialized equipment to eliminate unwanted odors. Throughout the restoration and water removal process, we can remove odors and clean the air with our Photocatalytic Oxidizers. The oxidizers remove odors, kill germs, and safely clean the air. UV rays emitted from the Titan form electron hole pairs that react with water and oxygen in the air to oxidize and eliminate bad odors. If you find yourself with water damage from rain flooding, give us a call at 978-777-3498. Ice dams can cause unwanted water damage to your home. Just when we thought spring was around the corner, Mother Nature surprised Danvers and Ipswich residents with almost a foot of snow last night! I think deep down we all knew another storm was in the works...it would be too good to be true to have such a mild winter like the one we’ve had this year in New England. Although it’s beautiful to look at, snow can often cause unwanted problems for home and business owners. Water damage from ice dams is a common issue we’ve seen throughout the years with our customers. 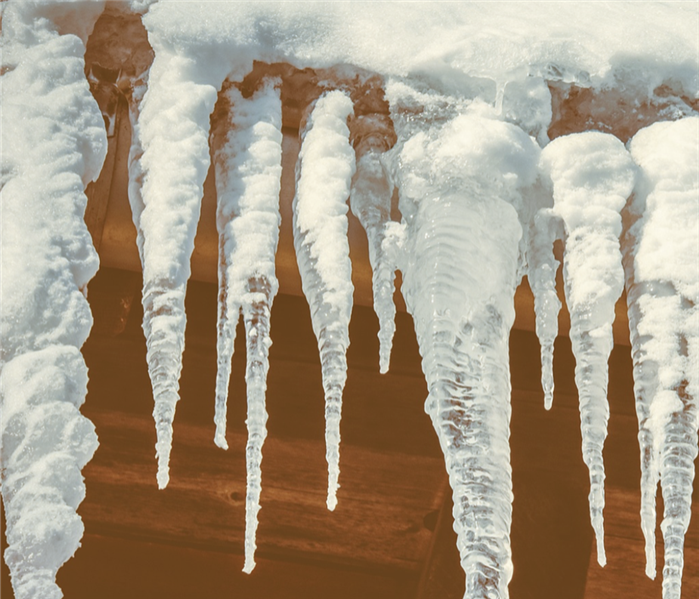 There are some preventative measures you can take to help prevent water damage caused by ice dams. An unsealed attic hatch or whole-house fan is a massive opening for heat to escape. Cover them with weatherstripped caps made from foil-faced foam board held together with aluminum tape. Make sure that the ducts connected to the kitchen, bathroom, and dryer vents all lead outdoors through either the roof or walls, but never through the soffit. More insulation on the attic floor keeps the heat where it belongs. To find out how much insulation your attic needs, check with your local building department. Spread fiber-reinforced mastic on the joints of HVAC ducts and exhaust ducts. Cover them entirely with R-5 or R-6 foil-faced fiberglass. Seal around electrical cables and vent pipes with a fire-stop sealant. Also, look for any spots where light shines up from below or the insulation is stained black by the dirt from passing air. If you experience water damage from ice dams, we’re here to help. Call us at 978-777-3498. Fireplaces are beautiful and cozy focal points in any home. Check out our safety tips to enjoy your fireplace safely. 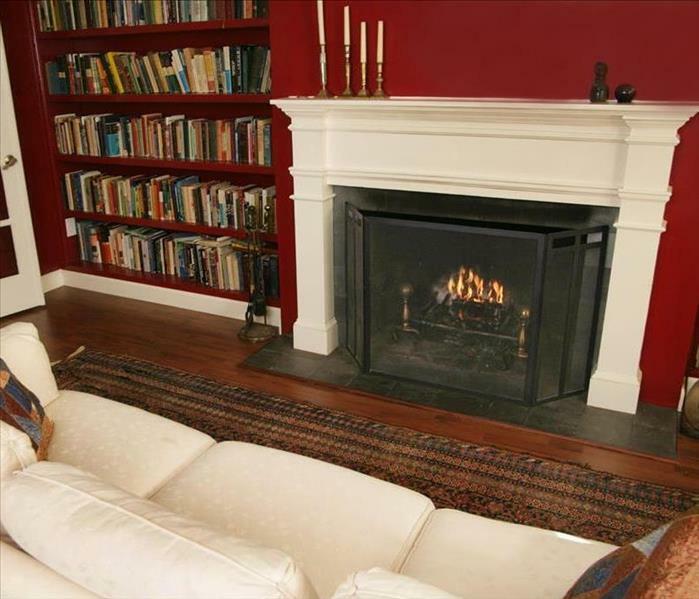 During the chilly winter months in New England, many Topsfield residents keep warm in front of a cozy fire. Whether you have a gas, wood, or electric fireplace, it’s important to follow a few safety guidelines to ensure that you are keeping your family safe from potential fire hazards. Get an annual fireplace and chimney inspection from a trusted professional to make sure your fireplace and chimney are in good working condition. Be sure that the chimney flue is open before the fire is lit. An open flue will allow the air to feed the flames and allow the smoke to exit. And like any other source of fire, keep your children and pets away from the flames. Many homes have an electric fireplace and although the flame isn’t real, safety precautions still need to be taken. Your electric fireplace is essentially a portable electric heater, and should be treated as such. Be sure that your heat source has enough space around it for the air to flow, and that it isn’t close to curtains or other materials that could potentially burn. Keep your electric fireplace away from any water sources, it should never be used near a washing machine, sink, or other source of water. Lastly, power strips and extension cords are not recommended; plug your fireplace directly in a wall unit. 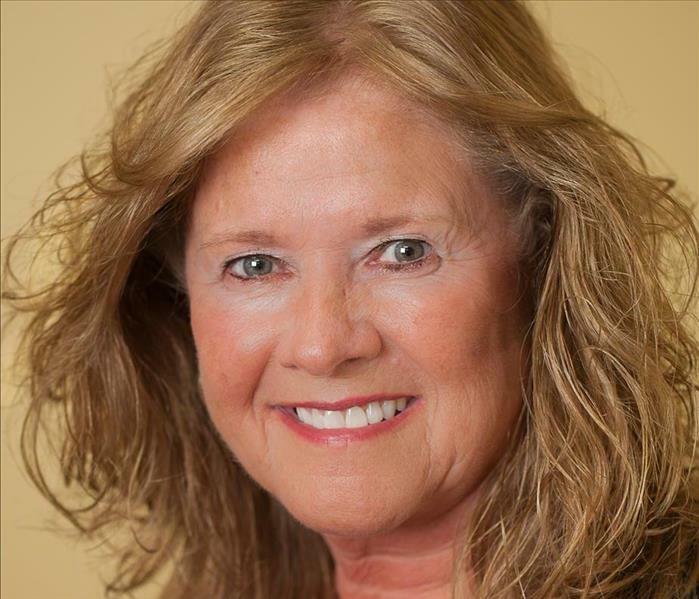 More than forty years ago, Sue and her husband opened SERVPRO of Danvers/Ipswich and SERVPRO of Haverhill/Newburyport. As the original owners, they began a journey that Sue remains a part of to this day. “It was important to build a reputable company and employ responsible people who do quality work", says Sue, who feels integrity is a key part of the continued success of the franchise. After many successful years in business, Sue and her husband sold the company to current co-owners, Dave & Maureen Hart to pursue other ventures. A few businesses and several years later, Sue returned to help out and hasn’t looked back. Her current position as Administrative Assistant keeps her busy with scheduling, billing & collections, and inventory. The deep industry knowledge she brings and the ability to wear many hats makes her an invaluable part of the team. When Sue isn’t in the office, you’ll find her traveling, enjoying time with family & friends and taking long walks with her husband and two dogs. 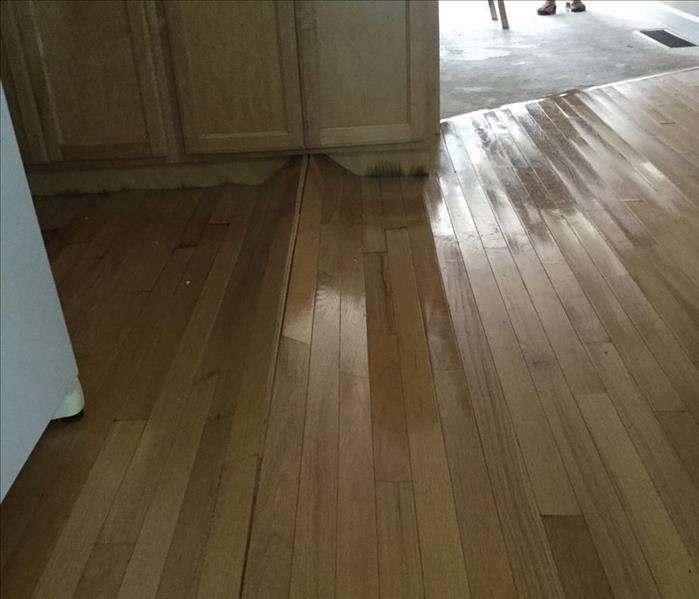 This image shows a hardwood floor that has buckled due to water damage. SERVPRO of Danvers/Ipswich is available 24 hours a day for water emergencies, large or small. When you are dealing with water damage, immediate action is crucial. A delay of just a few hours can greatly increase the severity of the water damage. We understand that when you call us, you may be feeling confused, stressed, and vulnerable. You need an expert to guide you through this crisis. SERVPRO of Danvers/Ipswich has the specific water damage training and experience to help you through this tough time. We specialize in water damage restoration—in fact, it's the cornerstone of our business. SERVPRO of Danvers/Ipswich specializes in the cleanup and restoration of residential and commercial property after a fire, smoke or water damage event. Our staff is highly trained in property damage restoration. From initial and ongoing training at SERVPRO’s corporate training facility to regular IICRC-industry certification, rest assured our staff is equipped with the knowledge to restore your property.